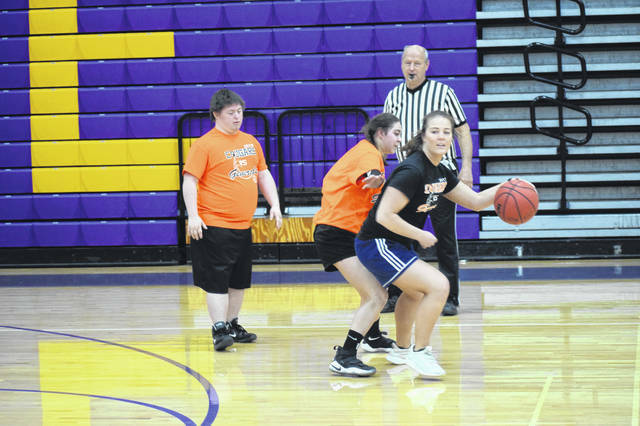 The Preble County Cougars reigned victorious over the Preble County Generals this past weekend. 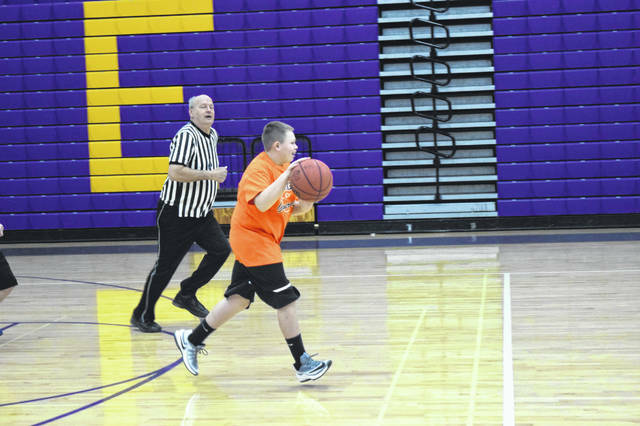 The annual benefit basketball game between the two teams was held on Saturday, March 16. The Cougars kept their title as Champions as they, once again, beat the Generals, this year 50 to 16. 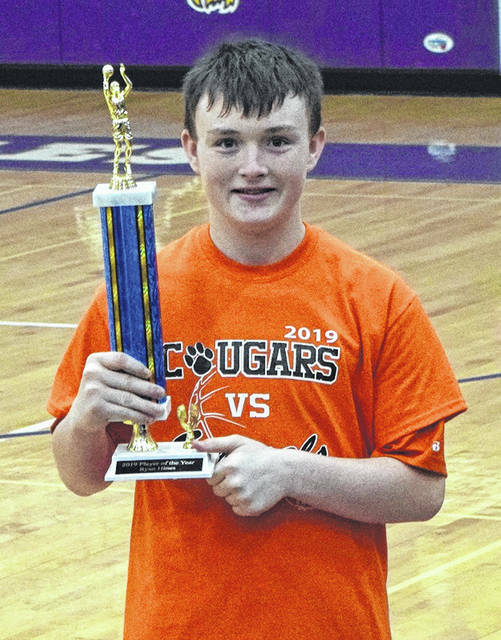 EATON — The Preble County Cougars reigned victorious over the Preble County Generals this past weekend. 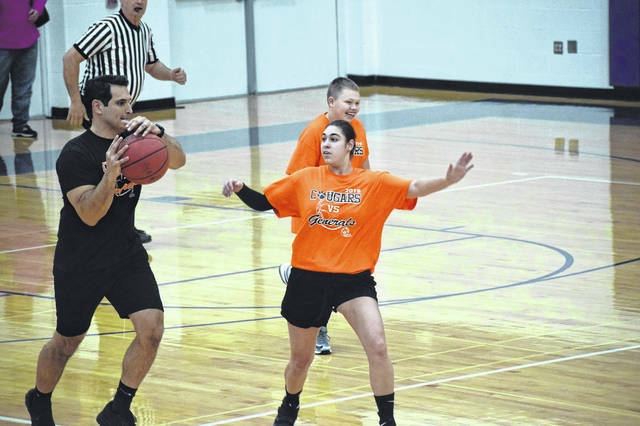 The annual benefit basketball game between the two teams was held on Saturday, March 16. 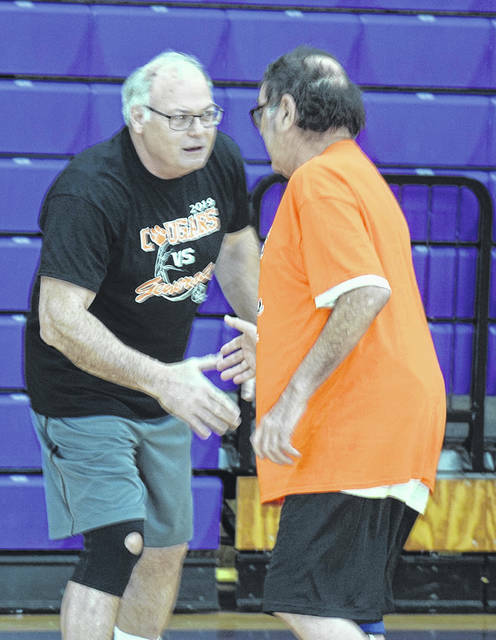 The Cougars kept their title as champions as they, once again, beat the Generals — this year 50-16. 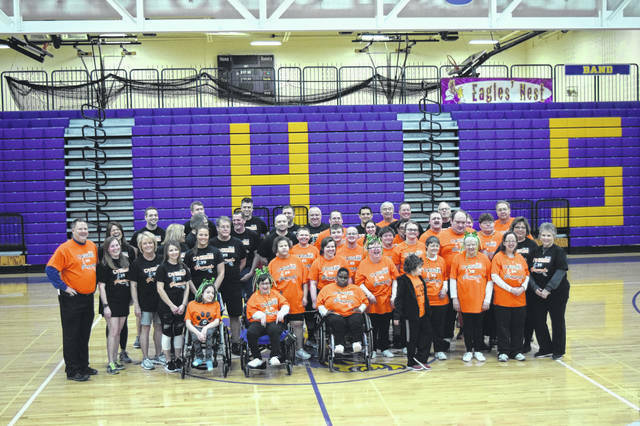 Not only was the day fun for all, but it also served to raise awareness for the Preble County Board of Developmental Disabilities and its clients. 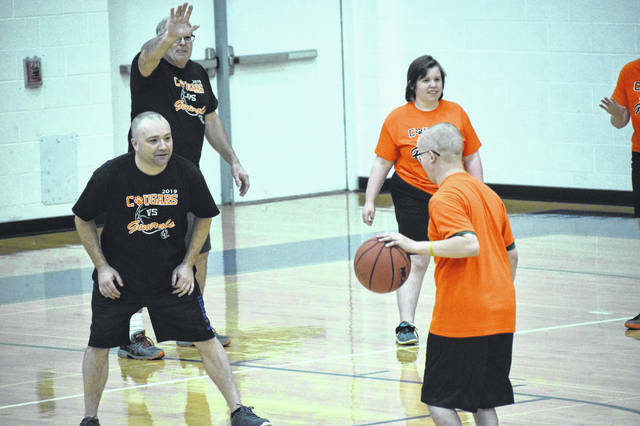 The Preble County Cougars team is made up of DD players of all ages and abilities. 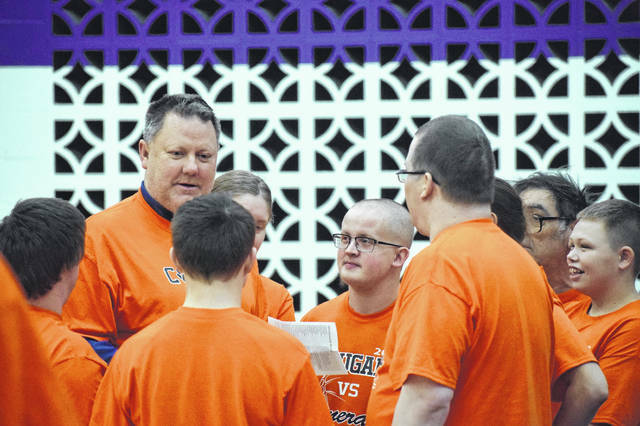 The Cougars compete throughout the year against other Special Olympics teams in the region. 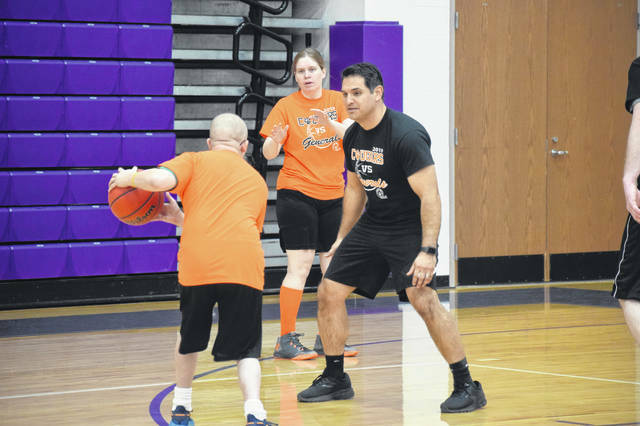 The Preble County Generals team is made up of local “celebrities,” such as Commissioner Rodney Creech, Mental Health and Recovery Board Director Amy Raynes, Eaton Community Schools Superintendent Jeff Parker, and other notable people. 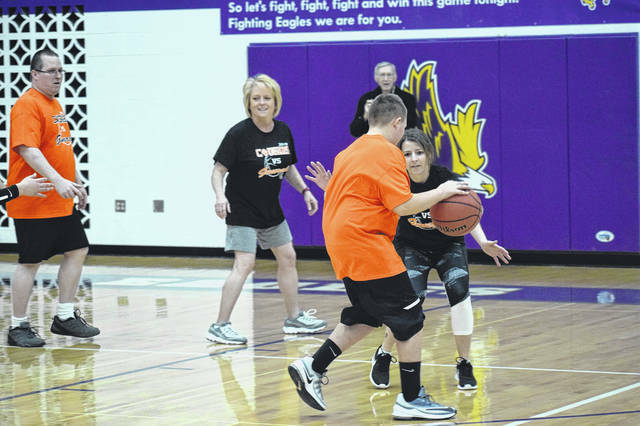 According to Special Olympics Coordinator Regina Fullmer, the event is held annually to highlight Developmental Disabilities Awareness Month. She added, this year there were more volunteers than ever before. For Mental Health and Recovery Director Amy Raynes, participating as a General has given her a chance to interact with individuals with developmental disabilities and bond with them. “This is probably the most fun event I go to every year. 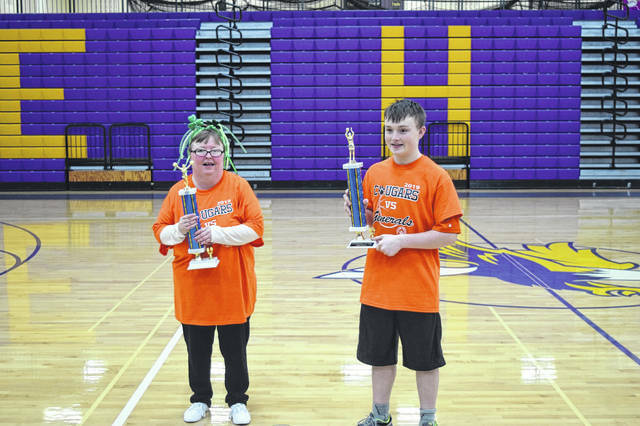 Individuals with Developmental Disabilities are still competitive, good at sports, and fun. 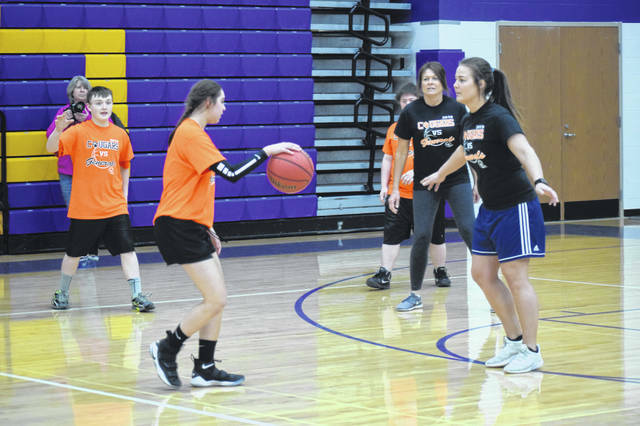 We have a really good time as leaders of the community to be able to spend time, play a game like basketball, really enjoy ourselves, while making sure the community knows how important it is to support individuals who have disabilities of any sort,” she said. 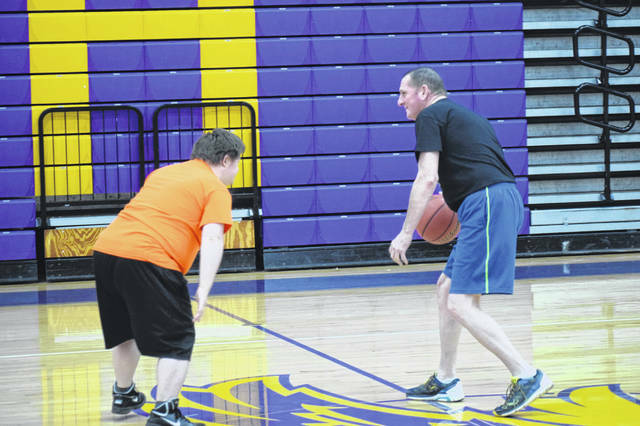 Eaton Community Schools Superintendent Jeff Parker has participated for many years now. 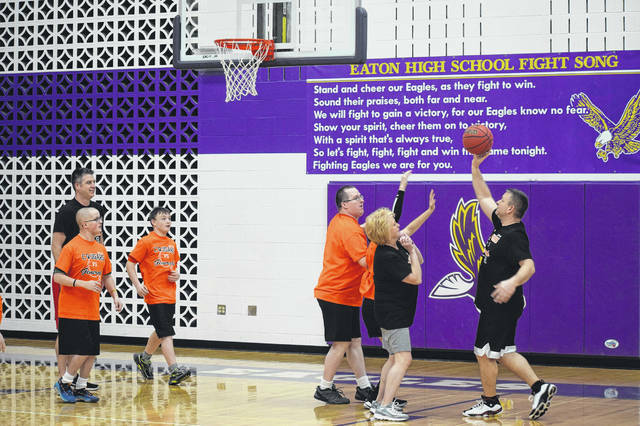 Not only does he feel it is important to participate as a General, but also for Eaton Community Schools to host the event and be a good community partner. “It is important to support these kids and families in our communities and bring a little more awareness. I’m really proud, our baseball team is here and I think it is important for them for their awareness and for them to see this,” he said. “They are an important part of our community. They have certain needs and challenges that we, as a community, should rise up and help them meet. During the event, awards for Most Improved Player and Cheerleader of the Year were also awarded. Ryan Hines was awarded Most Improved Player and Elissa Baron was awarded Cheerleader of the Year. 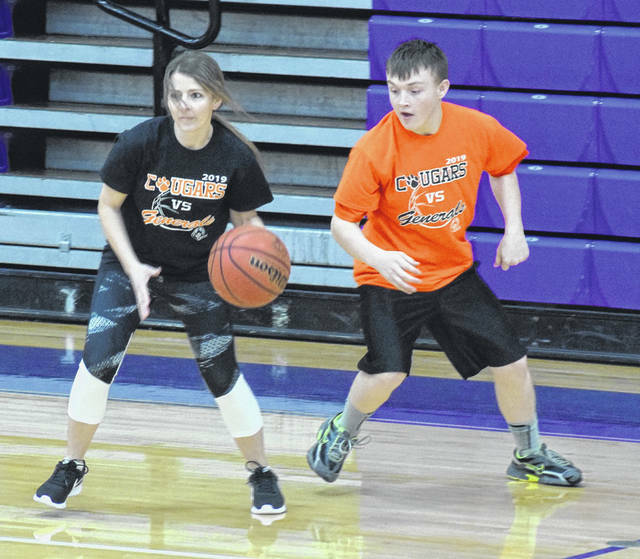 Cougar Players Sidney Hoskins and Ryan Hines just enjoy playing basketball and being a part of a team. “I’m nervous, but excited. 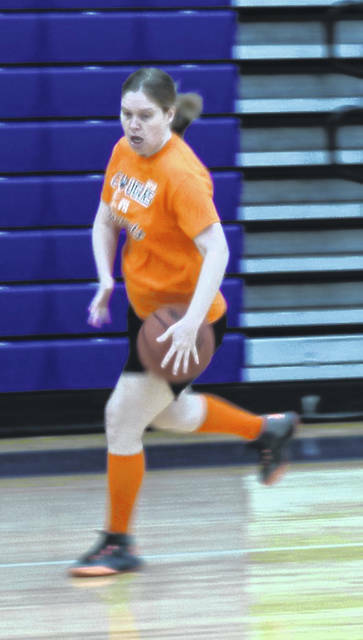 I like seeing people play and basketball is my favorite sport,” Hoskins said. 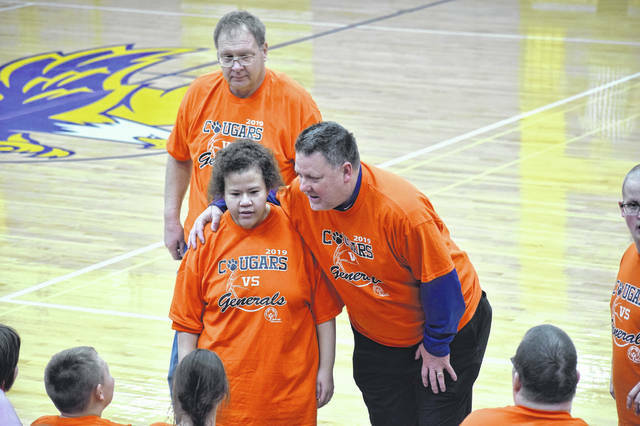 Not only did you have the Cougar Basketball Team, but you have the Cougar Cheerleaders. 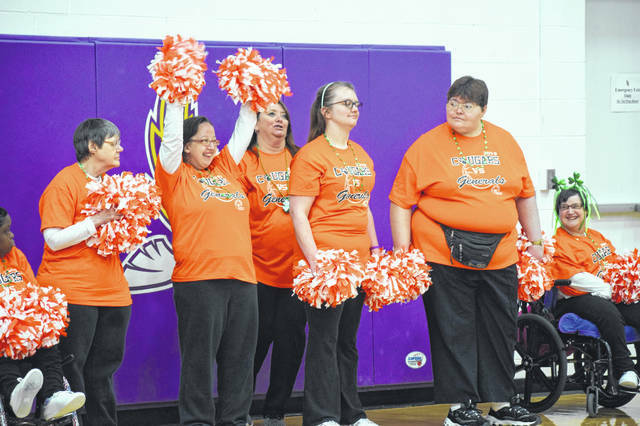 According to Coach Shelley Gray, the cheerleaders range from 72 to 17 years of age. This means the cheers aren’t changed often, but the team does their best and cheer hard every opportunity they get. “It’s important to show to the community what their capabilities are. Just because they have a disability, doesn’t mean they can’t do what everyone else does. We try to make it fun for them, there are a couple of them who are shy, but once you get a pom pom in their hands they come alive. They are just like everybody else. Just because they have a disability, doesn’t meant they’re any different from anybody else. 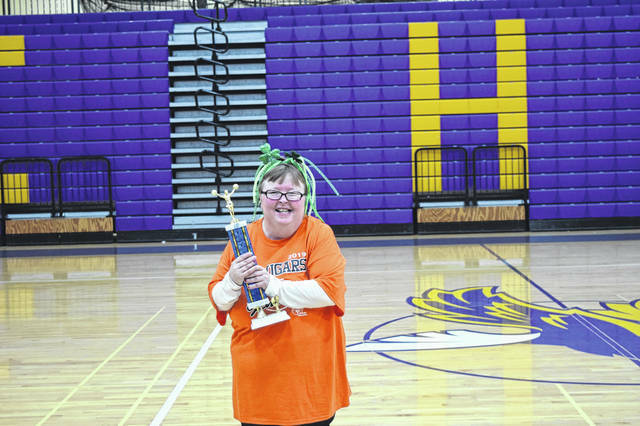 We’re showing the world that they are capable of doing what everybody else does,” she said. 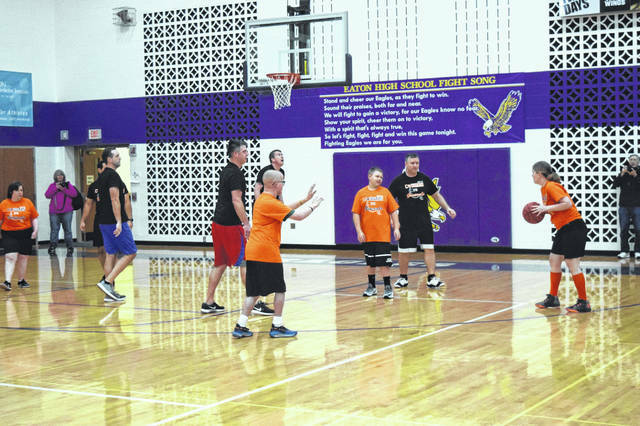 Special Olympics in Preble County is completely funded by donations and completely run by volunteers. They are always looking for volunteers to help with activities. The next big event will be the annual Track & Field Event to be held on May 4, at Twin Valley South Football field. They are looking for as many volunteers as possible. 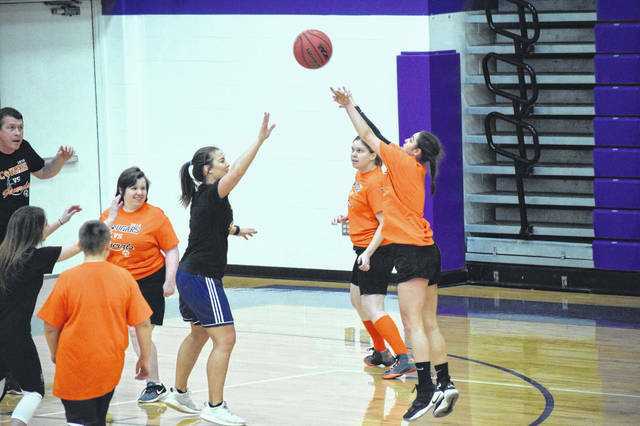 Volunteers can send an email to specialolympicspreblecounty@gmail.com or write to P.O. Box 273, Eaton, OH 45320.
https://www.registerherald.com/wp-content/uploads/sites/41/2019/03/web1_DD25.jpgThe Preble County Cougars reigned victorious over the Preble County Generals this past weekend. 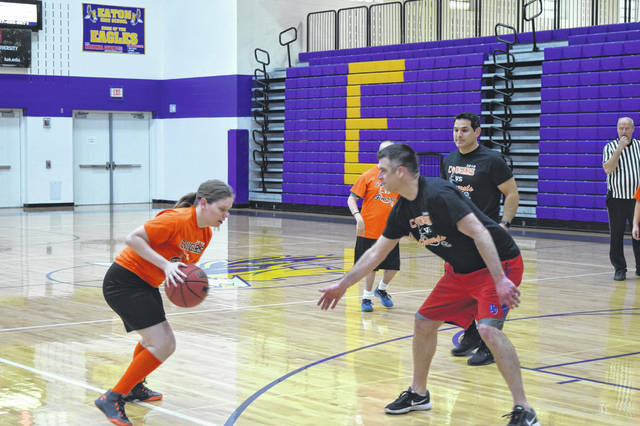 The annual benefit basketball game between the two teams was held on Saturday, March 16. 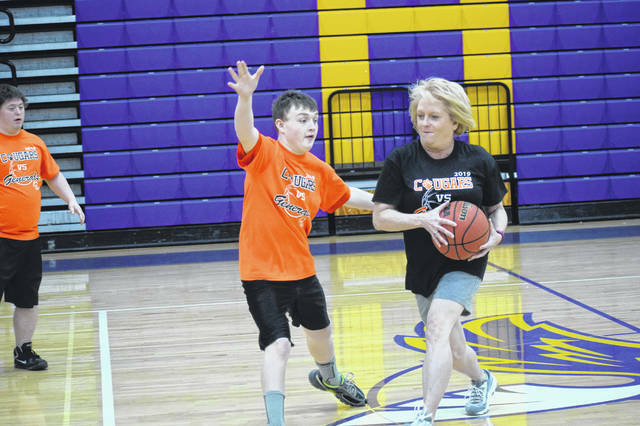 The Cougars kept their title as Champions as they, once again, beat the Generals, this year 50 to 16.